You know what else U stands for? How can you look at these jello shots and NOT instantly be in a good mood? It makes you think of tropical vacations and sun and smiles and just general happiness. I came up with this idea as I was brainstorming ideas for “U week.” As you can imagine, the options are limited. Last time through the alphabet, U week was one of the weeks I was in Arizona. Devon did gluten free udon noodles for me and Kim did her own creative twist on upside down cake. I decided to resurrect upside down cake in jello shot form. Because, when in doubt, just make a jello shot. Let's start with the garnish. I wanted to use fresh pineapple so I just cut large slices and then carved them into little disks. To help guide me, I used the inside of one of the lids from my plastic jello shots. I was really wishing I had a small round cookie cutter, but I didn't so I just made do freestyle. Also...AND THIS IS VERY IMPORTANT, SO LISTEN UP. If using fresh pineapple (versus canned), you MUST cook the pineapple. Fresh pineapple contains something called bromelain, which is an enzyme. It does not play nice with gelatin. But if you cook the pineapple, it will kill those enzymes. I simply stuck mine in a bowl with a tiny bit of water and zapped it in the microwave for like 3-4 minutes. (If you are using canned pineapple, this shouldn't be a problem). Allow to cool before adding to the shots. And if you don't believe me? Well, just as a little science experiment, I stuck a piece of fresh, uncooked pineapple in a cup of the jello, and this is what it looked like after about 20 minutes. Gross. Now, of course you can just take the easy way out and use pineapple flavored jello. But that's not how I roll. And I also had a few cans of pineapple juice in my cupboard left over from the Key Lime Pie Martinis last fall. So I used some of that, with a little sugar (though I think the sugar is optional) and vodka. I think Pinnacle's Cake-flavored vodka would be awesome here, but I was making these at midnight and only had regular vodka, so I added a dash of vanilla. Either way will work. (Vanilla Vodka or Whipped Cream vodka would also be yummy). Now, had I really been feeling ambitious, I would've put the fruit at the bottom of a mini muffin tin and then popped them out of the cups onto a platter to make a true "upside down cake" effect. But I was making them for kickball, so portable was key (my kickball team gets to be my guinea pigs for many of my jello shot creations). Pour into cups, filing about 3/4 of the way full. Once the jello has been setting for 45 minutes or so, (slightly firm to the touch), add the (cooked!) pineapple slice and cherry and pour a little more of the reserved jello mixture in to help keep everything in place and fuse together. Refrigerate overnight or for at least four hours. And then get ready to make some pineapple upside down dreams come true! Pour pineapple juice and sugar (if using) in small sauce pan and sprinkle with gelatin. Allow to soak in for a minute or two. Heat over medium heat until gelatin dissolves, stirring constantly. Remove from heat. Stir in vodka. Pour into plastic shot glasses, filling 3/4 of the way full, reserving some of the jello mixture at room temperature. Allow to set in refrigerator for about 45 minutes, or until just firm to the touch. 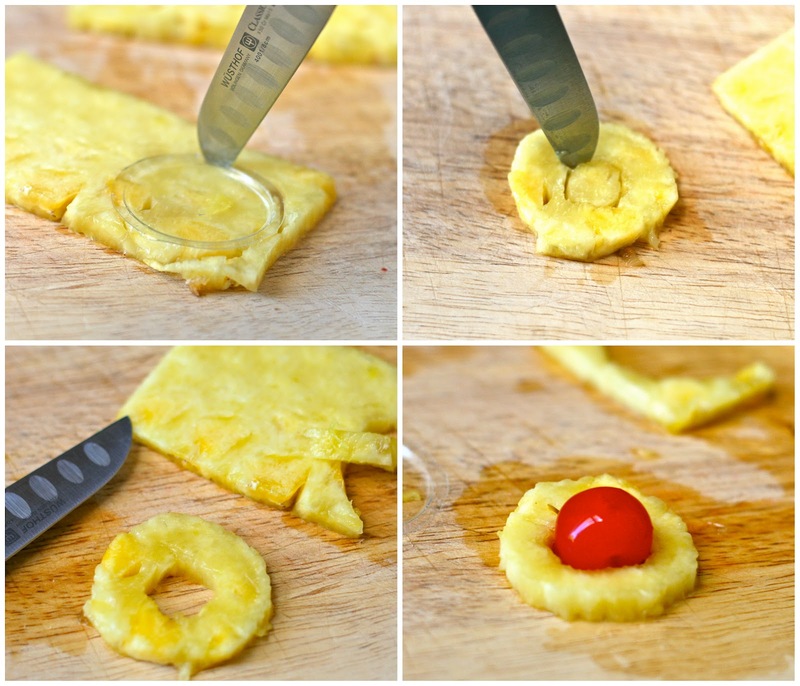 While jello is setting, prepare pineapple garnish. Cut small rings from pineapple and place in a microwave safe bowl with a tablespoon of water. Cover and microwave on high for 3-4 minutes or until pineapple is hot and steaming. Once jello has start to set, place cooled pineapple ring and a maraschino cherry on top, and top off with a little more of the jello mixture so that everything can properly bind together. Refrigerate for at least four hours or overnight. I don't make these as jello shots...yet. I make them as regular drinks or shots, depending on how bad my day was. Pineapple juice, cake vodka, and a splash of grenadine, which makes it look really pretty, like an alcoholic sunset! Regardless, they are yum. And dangerous. Sounds amazing. "Like an alcoholic sunset." I might use that later. You are a girl after my heart!! I have shared several of my jello shot recipes with a friend who has a website ~ jelloshotsrus.com ~ I have been trying to perfect this one and you have already done it!! This is one awesome recipe! thank you!! They are wonderful! Your recipe is being used here https://www.facebook.com/pages/Incredible-Recipes/117925708371194 and no credit is given to you. Just thought you should know. Credit is being given to them.. That is how I got here (: So, if there wasn't credit then, there is now. This is probably a dumb comment, but where can you get the plastic shot cups with lids? I want to make these to take to a tailgate this weekend but I have no idea where to get the cups! Thanks! i always get them at food service distributors like gordon food service. you can buy more for less than you would at a party or liquor store. and they have different sizes. They sell them at walmart. I can't wait to try these but i think i will take it one more step, I'm going to ues maraschino cherrys that i have been soaking in some moonshine. Hi there! The yield is listed next to the ingredients list on the actual recipe. This made 8-10 large shots. You can stretch it further if you make the shots smaller. I'm so sorry I was doing so many things at once that day I must have overlooked it. Thank you. If you like pineapple upside down cake, you'll love these! These jello shots have the same sweet and buttery flavor as the old-fashioned cake, but spiked!